John Caldwell: an Arsenal stalwart, but then…. The further this history of Arsenal develops the more we come across players whose life is a mystery. Sometimes with players from the 19th century luck can lead one on to a newspaper cutting, a remembrance by a relative who happens to know more, or wsomething along those lines but more and more I am now dealing with players of whom little is known. One such is John Caldwell. He played left back, and was born in Ayr on 28 November 1874. His clubs are recorded as New Mills, Hibernian, Woolwich Arsenal, Third Lanark, Woolwich Arsenal, Brighton United, Galston, Brighton and Hove Albion. I’ve made some progress in trying to trace his footballing history but beyond that I’m sorry to say there is nothing much. So, to football. The only New Mills I can find is in Derbyshire, but given that this is recorded as his first club, and he went from there to Hibs, I wonder if there was not in the dim and distant, a New Mills in Ayrshire. If you know, please do tell. Of the Hibernian adventure I have no information, but we know that he joined Arsenal from Hibernian in August 1984 and made his debut in a 5-2 defeat to Lincoln on the opening day of the 1894/95 season – Arsenal’s second in the league. Despite Arsenal losing their first three games that season and letting in 11 goals in the process John Caldwell kept his place, and in fact was ever present in the 30 league games and played in our one FA Cup game of the season (the cup game being the defeat to Bolton). It was in fact L Burrows, playing right back who took the hit, being replaced after those three initial defeats and not playing again that season and indeed only making one more appearance at all for Arsenal. The following season John Caldwell missed just one game – presumably through injury – but in his third season 1896/7 he did not come into the side until 19 December, his position being taken up to then by Sinclair. The game on 12 December 1896 was the notorious 8-0 defeat to Loughborough with Arsenal playing Leyton in the FA Cup on the same day. Now Caldwell didn’t play in either of these games, and a little research reveals that he was at this time playing for Third Lanark. One can but wonder if there were not some urgent enquiries in Glasgow to get John back. Come back he did to play 15 games including some at right back. He was back in the line up for the opening of the 1897/8 season and played his final game for us against Small Heath away in a 2-1 defeat on 23 April 1898. He transferred to Brighton United in the summer of 1898 and by chance we do have some more information on him at this point already on this site. For on 31 October 1898 Woolwich Arsenal played Brighton United, and there is an article on Brighton and in relation to this game on this site. Although it says little of John Caldwell it does give quite an insight into the way football was organised at the time and the things club owners got up to. But on John, beyond that, sadly there is no more, save the record that he went on to play for two more clubs. If you do know anything else of John Caldwell born in Ayr on 28 November 1874 please do write in. 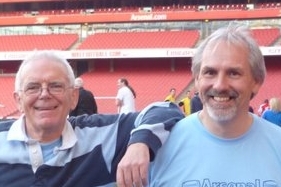 1 comment to John Caldwell: an Arsenal stalwart, but then….